I came across this fraudulent and otherwise hideous duckling in a thrift store and was unable to resist. It was overpriced, which is consistent with historical precedent for this model. 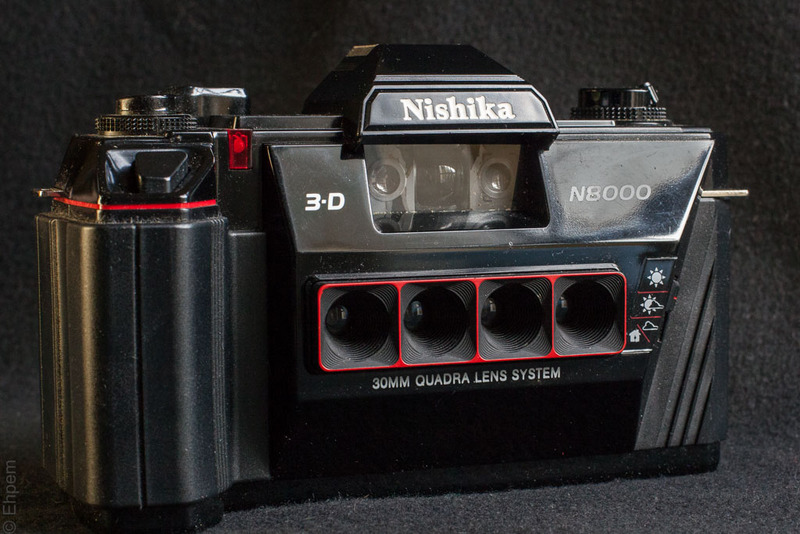 The Nishika N8000 was designed to take photos that could be made into lenticular prints – expensive layered 3D images that were available through their plant in Nevada and a few other places as the camera become somewhat popular. Since they have, unsurprisingly, gone out of business getting such prints made is next to impossible now, although there do seem to be options to get prints made from scans (here). These cameras are still available as new old stock, but there is a web page dedicated to pulling apart the marketing hype that accompanies these cameras, and this one gives some fascinating history of the original marketing fraud (here, page 86-87) used to sell them. Then there is the camera itself, a study in fakery, which I will get to in a minute. This is the sister post to one at 52 Rolls which has more of the testing results (some are below as well) and not much about the camera. Check that post, From the Ridiculous, for most of the results from this test roll of film, including several animated gifs. So so why did I buy this camera? Impulse mostly as it must be the only camera ever made with the word Quadra on the front, which rings bells for me since I am spending a lot of time doing research on Quadra Island these days and before that worked for years from an office on Quadra Street. Well, actually, it’s superior progenitor the Nimslo 3D also says Quadra on it, so it is one of two, but I doubt I will ever cross paths with a Nimslo. I did also have an eye on the possibilities offered by groups of four nearly identical images, and for $14 it won’t be a huge waste if it doesn’t work out; the batteries in it were still good, for what little that is worth. Sounds like a bunch of excuses for impulse buying, and that too is true, but there is no buyers remorse as I write this, having yet to see the results of my test roll. The camera shoots four half-frame images at a time (using two 35mm frames worth of film per shutter release) and thus a roll of 24 will produce 12 groups of four images. This means adjacent frames from different shutter clicks can be scanned together without wild aspect ratios so it is possible to take, for instance, two associated sets of images and then to scan the adjacent two frames from each set to create different kinds of image combinations from those I have been making with my half-frame Olympus Pen (examples here). If I want to go the distance I could also manipulate the images digitally to create 3D versions usable with 3D glasses like they hand out in movie theaters. Or set them up to use with stereoscopic glasses like those for air photo interpretation or viewing 19th Century stereo photos. I suppose I could also use them to create 3D digital models with the right software. And people do make gifs from them (see here) which looks like it could be fun, with the right subject. Uses only 100 ISO film with a fixed shutter speed of 1/60th second. It does have three apertures – one for sun (f19) one for partial cloud (f11) and one for cloudy/indoor conditions (f8) – but a 2.5 EV range it is barely going to make a difference with a forgiving C41 processed film. The lenses are plastic, though said to be coated. The lenses are notorious for heavy vignetting. Many complaints were made about quality control for alignment of lenses when it was still in production. Fixed focus with 5.5 feet the closest distance. There is a fake LED screen on top which has an “ideal 3D distances chart” printed on it with LED style characters. Yes, you read that correctly. The flash shoe has three contacts as if it were for a somewhat sophisticated flash but two only make contact with the plastic camera body; more deception! The batteries are contained in a bump that looks like a power winder, though the camera is manually advanced. The film advance lever and rewind lever sit atop knurled discs that look as if they should turn for extra controls. They don’t turn, or do anything except look like they should. The whole thing is plastic except for a metal bar (said to be lead) added in the base to give reassuring but totally unnecessary heft. Its the size and weight of a brick. Made by an American company using a fake Japanese name in the era when Japanese design and manufacturing quality were finally being recognized by the North American buying public. Coincidentally? this was a time when quality of many North American goods plummeted. 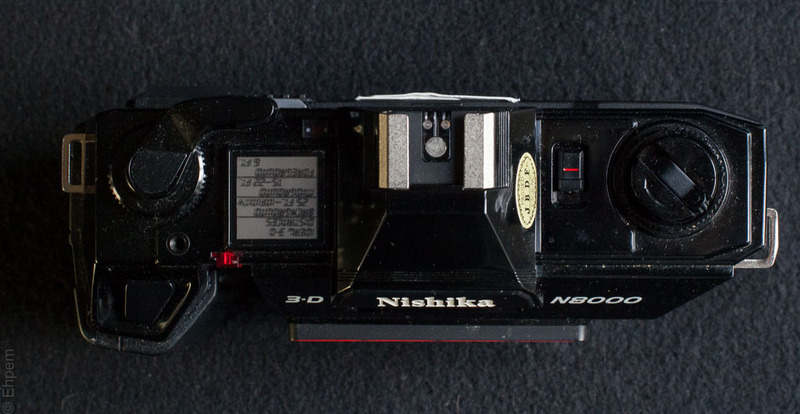 Nishika bought the patents from Nimslo when it went out of business, and then dumbed the camera down in many (most) ways, from lens quality and exposure control to portability. History of marketing fraud from inception to current sales of old-as-new stock. Powered by easily obtained AA batteries (quite what is powered other than the battery check light and exposure warning LED is not clear, and why that would require two AA batteries is beyond me. Has a battery check light. Unmissable red low-light warning in viewfinder. Works fine without batteries if you use it in sunlight to overcast conditions. Film or other note holder on rear door, although it is too small for a 135 film box-end. Secure metal tripod connection (in case you can’t hold still a 30mm lens at 1/60th of a second, which you should be able to). Can use simple flash on hot shoe, so long as it syncs to 1/60th and you remember to set the aperture to the cloudy/indoors setting. Some basic exposure control over 2.5 E.V. range. The manual makes, in places, for an amusing read. For instance: “The camera back, when closed, prevents unwanted exposure of the film to light”. When closed? Dang! That’s what I’ve been doing wrong all these years. For many reasons, parsimony not among them, I loaded this camera with film and gave it a try. I wanted to test the camera with the recommended film speed, just to keep the variables under control while analysing the results. I could not easily locate a roll of ISO 100 C41 processed film, colour or black and white (C41 being the least expensive for commercial processing). So, I put in a roll of Ilford Delta 100. The film is not too pricey in this area, but the processing is and I am not yet set up to do my own (see what I mean about lack of parsimony?). I am hoping that there is enough latitude in this film to forgive some poor exposures, and that it is fine grained enough to compensate for the half-frame sized negatives. The commercial labs do not have masks in their scanners that would allow a single image with all four frames which meant I had to spend a whole bunch of time digging my study out from under a house guest’s things so I could use my scanner. Why is it that this camera seems a catalyst for work? So, I wrote the above 6 or 7 weeks ago when I first got the camera, but before I had a chance to scan the film. As it turns out, the space between groups of frames is quite large (and highly variable) and this means that the film strips are just a but too long for my flat bed scanner’s film holder and I had to flip the negatives after scanning two out of three groups on a strip in order to get all of the third group in a scan. So, that adds a lot to the work of scanning. I am pleasantly surprised by the image quality. I was not surprised by the vignetting, it has been commented on by other users. Exposures were a bit of a challenge, and I sometimes forgot to change exposure compensation and generally pushed it a bit hard for the available light. But overall, there is something in each group that I can like. I especially like the repeating nature of some of the images, mostly on the most simple graphic compositions. To see an enlarged version of any image in the gallery below, click on it and then navigate to others with the arrows or swiping. I just found a blog that makes a lot of use of the Nishika N9000 – a better model than the N8000. If these cameras really turns your crank, then check it out as there are experiments with gif speed and it looks like with cropping the image in the gif to get closer and other things like that. https://lostaruban.wordpress.com/nishika-3d/. It does make me reconsider whether to run more film through it, perhaps I will in a weak moment. This brings back memories. I worked on the print materials used for this camera and used it on a regular basis for quality control. I still have some prints made from it. We took the supplied lenticular backing and coated color paper emulsion (a total of 7 layers in 2 passes), tested it and converted it into rolls to be printed in a modified printer. Other than a contract to coat the print material, we had no association with Nimslo. The coating of the print material was an extremely difficult and complicated operation. I never bought a camera as they were, initially, quite expensive and, as you say, not very capable of providing good prints. Printing a roll was also very expensive because the print material was expensive to produce and there was only one place to send it. Turn around time took weeks, too. I’ll try to dig out the prints to see if they held up but I don’t have high expectations. I do have a photo of myself, taken by a friend, with the camera around my neck and it’s clearly visible. I’ll try to dig that one up, also. This camera could be a rare collectors item since I don’t think many were made and fewer were kept in good working condition as this one. Hi Ken – what a fascinating comment – so strange that one of my most loyal readers has a direct connection to this technology. I suspect that your involvement might have been with the earlier and far superior Nimslo camera. Nimslo had glass lenses, and more control, and probably produce much better photos. I think that they are rare and thus collectible. The Nishika company bought the Nimslo patents and then dumbed down the camera quality. They seemed to have produced a lot of the cameras which became popular for a while before they went out of business, at least in part due to large fines associated with fraudulent advertising. This model of camera is still being sold in original new packaging on a certain auction site, and other places. They must be the surplus stock from the bankruptcy days. They too are being sold with misleading advertising – the blurb that goes with the sale offering makes reference to features found only on a later model (N9000 I think it was), and otherwise promotes features common in all cameras of the era as if they are unique and special. There is a link in my text above to a page that deconstructs those ads. So, if anyone is interested enough to obtain one of these lenticular cameras, they should look for the Nimslo which was a better camera to begin with, is quite rare and thus should hold its value and was never wrapped in misleading advertising.